Okay, there is now about 11 inches between the arm of the couch and the bed. 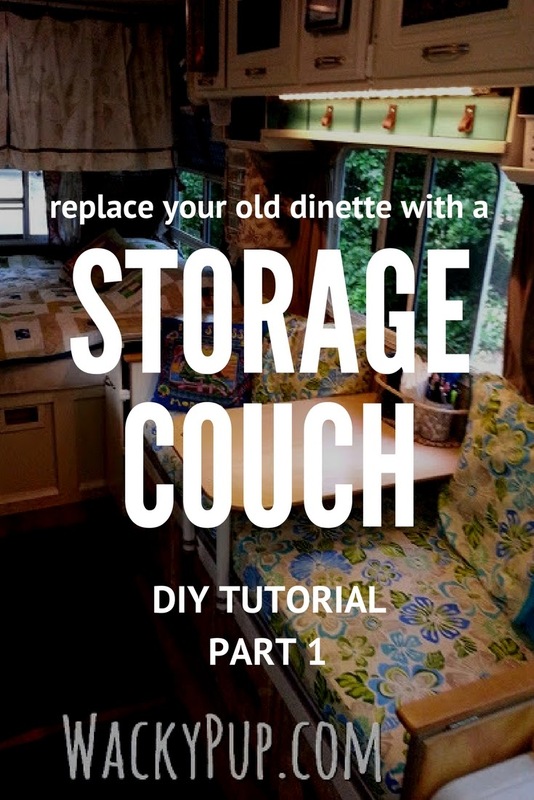 This is a major improvement, the dinette used to be flush against the edge of the bed which meant all four corners of the mattress had walls on them. It was so horrible to make up that bed! I designed a shelf that is 10 and a half inches wide, 24 inches deep and the height of a dining table. 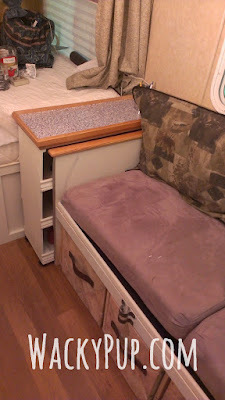 The shelf fits neatly between the couch and bed, and is on wheels. I can roll it out to make changing the sheets or just making up the bed so much easier! I guess I have no more excuses. It adds 6 linear feet of new storage for things that used to sit on top of the dinette table. The top is actually in 2 pieces. 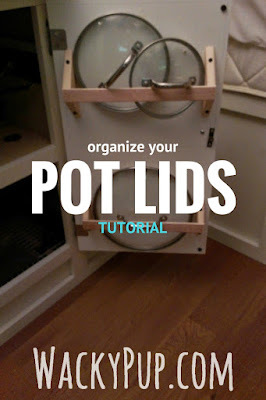 A tray that fits down over the top of the shelf can be removed to use as a bed tray, or to carry items out to the picnic table. I've designed a bracket system to build onto the top shelf it will allow the tray to sit flush with the top of the shelf and create a table that is approximately 24 by 22. I'll have pictures and a tutorial up soon! Update: We did use the table a couple times, but then my wonderful daughter-in-law gave us a Lifetime 'Personal Table' that is PERFECT! 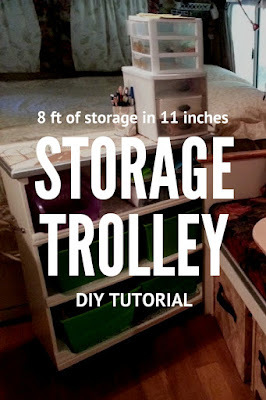 The larger table has the advantage of going from coffee-table height to counter-height! 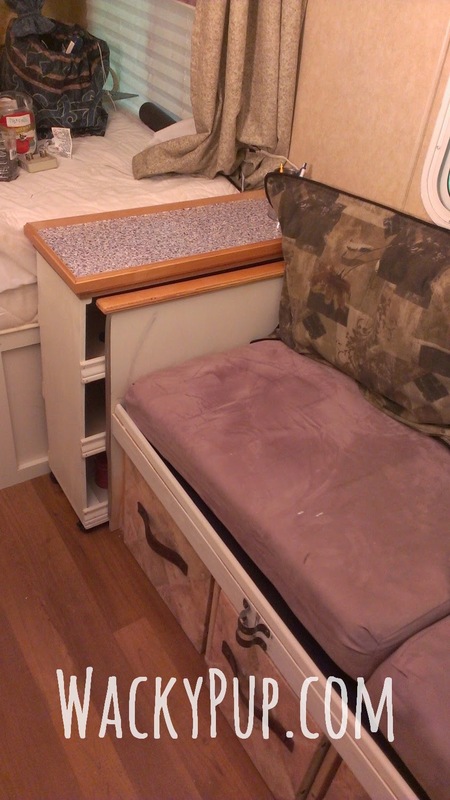 We use it outside the camper as an extra counter for preparing food or just a place to keep things off the ground. 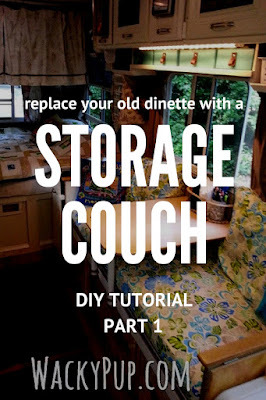 You can see how much is taken up by the dinette - so follow along as I get rid of it! You may know that I love to camp. 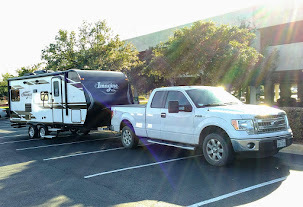 We have a small (tiny) camper - a 2008 Fun Finder 189FBR by Cruiser RV that we bought new and have not used much at all. We probably use it a total of about 5 nights a year. Well, I am determined to change this!